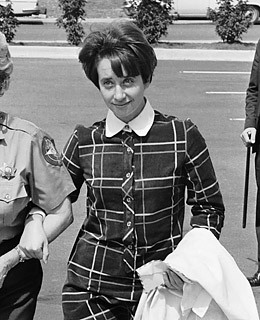 Eisemann-Schier was the first woman to be placed on the FBI's most-wanted list, in late 1968. Along with Gary Steven Krist, she was wanted for the kidnapping of Barbara Jane Mackle and extortion. The wealthy Mackle family eventually paid a $500,000 ransom, and Barbara Jane, a 20-year-old college student who had been buried in a box 1½ ft. underground, was discovered safe. Krist was captured within days, but Eisemann-Schier, a 26-year-old graduate student, remained a fugitive for more than two months. She later pleaded guilty, saying she had been in love with Krist, the mastermind of the plot. After a few years in prison, she was paroled and deported to Honduras.